First morning at Kew meant meeting more people than I will remember the names of, so it was good to spend a quiet afternoon weeding out ivy from the lake bank with just one colleague. During the internship I will be working alongside a 3rd year student of the Kew Diploma in Horticulture: we have an area of the gardens assigned to us for maintenance: the South Canal beds, where the Rosaceae collection is sited. However, on my first day, I have been working with another colleague, who takes care of the lakes, and will teach me how to drive the tractor, something I am quite excited about... I remember a few years ago one of my bosses was studying towards a Masters in Horticulture and she had a whole exam on how to drive a tractor... Even back then I thought it would be fun to learn, so when I was asked whether I was interested in some training I accepted straight away - and I'm looking forward to it! 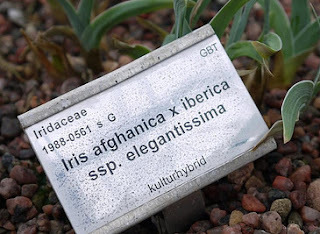 You find what is called the "ACCESSION NUMBER" that is the unique number associated to the plant when it was recorded into the garden's archive. 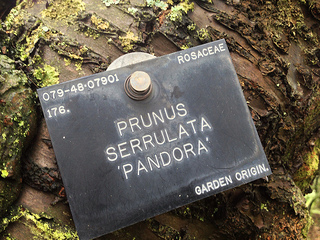 Some labels have a date as well, which is the year the plant was recorded (not when it first germinated - as plants can be acquired at any stage of growth - or when it was acquired to the garden - as for various reason it might not be recorded when first acquired - but when it was actually recorded). On the second line, the code for the donor, who provided the plant, is indicated (that could be, for example, a botanical expedition). The FAMILY NAME of the plant is indicated. You have the NAME OF THE PLANT. Plants have common names for you and me but for the international community of botanists, they are identified by what is called the binomial name, made up of genus (within the family, grouping of plants sharing significant features) and species (basically, within the genus, a grouping of plants that share even more specific characteristic and can reproduce among themselves, but will not reproduce with another species within the genus - with exceptions). There may be other parts to a plant name, for example the variety or the cultivar (as is written in brackets in the label I pictured); they describe even more specific characteristics a group of plants share among them within the species, but the binomial parts are the core of a plant's name. Binomial names have a major advantage on common names: they identify a plant univocally, so that people from different languages or dialects do not risk mixing their plants up, which, for example, would be quite tricky from a conservation's perspective, if you were trying to save a rare foreign plant from extinction... There are also extra benefits, if you are interested in plants, as the binomial name usually describes the characteristics of the plant: its shape or colour, the country it originates from or the habitat in which it lives... Kew put together a lovely information sheet on plant names. At the bottom left there is indication whether the plant originated in the wild, and whether its identity has been verified. This is useful information for research and conservation purposes. Note there is nothing in the label pictured above. Finally, at the bottom left, which geographical region(s) the plant is native to. In this case, the plant was cultivated. So, next time you are at Kew, just one look at the label and you'll know everything about the plant that is in front of you!